Fig. 141 Ecological pyramid . 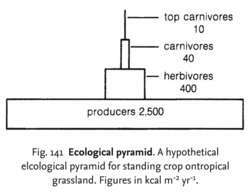 A hypothetical elcological pyramid for standing crop ontropical grassland. Figures in kcal m-2yr-1. the PYRAMID OF NUMBERS, which illustrates the numbers of organisms at each TROPHIC LEVEL (see Fig. 263 ). the pyramid of BIOMASS, based on DRY WEIGHT (or occasionally live weight) at each level at a given time. the pyramid of energy which shows the energy flow between each level. See FOOD CHAIN. They now understand that the entire industrial growth-worshipping society has brought us to the brink of ecological disaster and must be replaced by a new model that removes humans and their needs from the top of the ecological pyramid and places them on an equal footing with non-humans and the earth's natural systems. The standard textbook description of an ecological pyramid (or trophic pyramid) displays high-level predators at the top, occupying the smallest part of the pyramid, and phytoplankton at the bottom, occupying the largest part of the pyramid. With its position at the top of the ecological pyramid, the tiger is the symbol of India's wealth of wildlife.